Should Scotland be independent ? That question was asked a few thousand times over the last months. Newspapers write about it on a daily basis, polls are conducted and discussed and even my Austrian friends ask me that question over and over again. Are you pro or against being independent? From trying to sound super informed about the topic, as I am now living in Edinburgh, I started to answer with a even more clever – I don’t know yet, I need to do more research before i will answer that question. A recent poll showed that about 23% of 16-24 years old also “don’t know” what their going to vote for in september this year, but is it really the fact that they don’t know yet ? I think most of them just don’t care and to be honest i really don’t care either. I tried to inform myself several times, searched the internet to get my personal pro and contra list and finally gave up. It is a fact that England and Scotland not always have the same needs so some laws are just not suitable in both countries, so here is one of my “YES Scotland please get independent” arguments. On the other hand Scotland profits a lot of being british and it could have bad influence to the economy if Scotland gets independent. I could continue that list, but in the end I really don’t care and just leave the decision up to people who do know and do care. When it comes to the Scottish independence referendum, I’m not sure. It’s not a case of a lack of information as such, but probably a bombardment of disinformation. When the original idea of an independence vote came around I was prolifically no. But really it was because I was thinking of ‘if it’s not broken, don’t fix it’. But that’s a pretty shallow argument, so it took a bit of thinking to arrive where I am now. I would say that I’m on the fence, leaning towards yes. My lean is attributed to one section of arguments: politics. The reason for that is because the way I see it the only spectrum in an independent (or not) Scotland that can truly be predicted is political. The current state of affairs isn’t particularly desirable as Scotland is under a Conservative/Lib Dem coalition that we specifically didn’t vote for. I come from an area of Thatcher wasteland so for my community being ruled by Conservatives is a huge injustice. So, at least if we were independent we would be ruled by a government that we actually voted for. Thin argument if that’s your only one though. The other side of the coin is that if we vote no then how would Scotland be treated as part of a country that we tried to escape. I dread the thought. For me, that ends all viable arguments. For there is no models to compare of an already developed country in a similar situation. Because Scotland and the rest of the UK are so similar, I can’t see there being many social or economic arguments either way. This is unlike the situation with the Catalan region of Spain, which with the huge tourism industry in the region, if they were to become independent, and follow other small countries in installing a duty free law, could see their area turn into a country or principality such as Andorra or Monaco. The way I see it Scotland will remain indifferent. Even though I have only been in Scotland a little over two weeks, it seems that the way politics are handled here are not so different from the way they are back home in the U.S. of A. Before I hopped on that 9 hour flight to Edinburgh, I was told by many people to be excited because I was going to be in Scotland during a very turbulent but exciting time–a time where the word “independence” would be whispered with feelings of adoration and beguilement. “How exciting,” I thought. “How lucky I am to be able to be in the midst of a group of people stirring with the same emotions that stirred in the hearts of those who fought for the freedom of America.” A bit nostalgic and a tad overemotional of a thought perhaps, but, hey, that’s just the kind of girl I am. Upon arriving in Scotland, I was driven to my flat by a man with whom I conversed about the Referendum a good bit. He was an older fellow who seemed to believe it was high-time that Scotland had its independence; he wanted to vote Yes and believed that this country could easily sustain its own economy with oil and, to no stereotypical surprise, its whiskey. Since he was the first Scottish individual I had spoken to about the issue my whimsical picture of the fight for Scottish independence was perpetuated. The second individual I spoke to about it was a uni-age guy who had some very interesting beliefs that he was gathered from a myriad of different sources. He believed the whole vote to be some what of a conspiracy–a way for the Scottish government to trick the English into giving Scotland more power by threatening a YES vote. An interesting idea to be sure. The third group I spoke to were two of my classmates who both held a similar view of the issue: disillusionment. Ah yes, now this feels like home. Discussing the topic with them made me think for a quick second that I was back in North Carolina talking about “politics” and the next big issue with a few friends at coffee. They both see the whole issue of independence as an issue that could have maybe had merit at one time or another but due to oversaturation by the media and the ridiculous blind-loyalty of Scottish Nationalists neither of them really want much to do with it at all. I can’t blame them. Oversaturation of politics in the media is something I am quite familiar with as an American, especially as an American student whose home university is very liberal. It seems like everyday the young adults and 20 somethings of the U.S. are bombarded with different viewpoints on a whole host of different subjects but one thread remains common amongst them all: the issue is never really the issue. Now, what I mean by that is the topics the media chooses to speak on are rarely at the actual heart of the issue at hand. Rather, they focus on the fringe issues that get people really heated up and polarized like abortion, homosexuality, freedom of speech, etc. None of those issues are wrong to discuss at all; however, most of them they are abused, used as distractions from discussing the topics, though perhaps less clear and more difficult to handle, that truly affect the situation. For the issue of the Referendum, this fringe issue that everyone seems to be playing on is the hatred of the Tories and/or the English in general. The YES campaign, according to my classmates, appears to be driven by this essential polarization: either you want to continue to be associated with the English/Tories or you are a loyal Scot and want nothing to do with them. Quite the heavy-handed viewpoint, is it not? This is what politics has become in America and it appears to be no different here. And, because of the plethora of information coming at us from every direction in this world of 24/7 news media cycles, the issue gets lost. It is so hard to discern truth from extravagant lie and because of this, it is so much easier to just sit back and let other people handle it all. We just want our peace and quiet right? Why does anything have to change at all? While I agree with this to a certain extent, there is no denying that if all of the sensible people decided to sit back because they are overwhelmed, that means that the floor is open for all those extremists with their heavy-handed opinions to make the final decision. And, let’s be honest, no one wants that. But how is one to wade through all the muck of the political media marsh in order to find solid ground? What everyone wants to know is if Scotland can survive on its own, monetarily and politically. But, the majority of what appears to be discussed in the media focuses not on that central question but instead on the perks of saying YES and what a terrible Scot you are if you say NO. Now, don’t take my word for it for I am just a wee American lass attempting to understand a complex issue about a country that is not my own. Even though I am still very much in the dark, I am intrigued. So, ermm, let the games begin?? To leave the UK or to stay, that is the question on the minds of the Scots. Will we be better off as a independent county or will we fall apart? Can we stand on our own two feet? Will we survive without England? Those are a few questions you’d find yourself asking if you are a Scottish citizen in 2014. You’d think that people in Scotland would want to be independent but as it turns out, a lot of Scots want to stay part of the UK. This really surprises me. Maybe it’s because I am from the US and being free/independent is what I’ve grown up with. England is nothing like a dictatorship towards Scotland, Scotland does make their own decisions involving education and health care. So maybe staying part of the UK is the best choice. If Scotland did end up leaving, could the country survive without the help from England or would they crumble under the pressure? Does Scotland have enough resources to keep the country going strong or would it only be a matter of time before they would go running back to England? It’s hard to say what the future would hold for Scotland if they did receive their independence. Don’t get me wrong, Scotland might become a great country on it’s own and be just fine. Really , it could go any way and there is always that fear of the unknown and the what ifs with every huge life -altering decision. But you have to risk the bad to see if the good will follow. Patriotism also plays a role in the Scottish Referendum. Obviously there are people in every country that feel proud to be what they are and this applies to Scotland. I’m sure some people want to be independent just because they can be. It’s hard to form an opinion on whether or not Scotland should stay or leave the UK because I have only been here for 3 weeks. A few Scots that I have talked to are leaning more towards voting no and staying part of the UK. Maybe it’s because all their lives they have lived with British influence and couldn’t think of any other way of living. Or because they don’t think Scotland can survive alone. I guess the only thing to do now is wait for the vote and see what Scots choose to do. Take a risk and become independent or play it safe and stay in the UK. 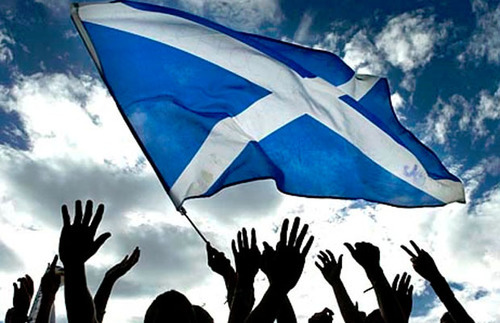 Scotland: the country that gave us Robert Burns, William Wallace and Ricky Ross. It’s also the country that has given us an entertaining, yet dreary independence vote. Ever since the Scottish National Party pledged to hold an independence vote in their manifesto in 2007, it has almost come to the time where Scottish people make their decision to whether they want to vote ‘Yes’ or ‘No’. While there is plenty of time to make a decision on whether you want to vote for ‘Yes’ or ‘No’, the topic of independence has grown tiresome. Most Scots are prevalent on Twitter and the aspect of social media has been a significant factor during the Scottish independence vote so far. This is mainly down to the SNP’s idea of implementing social media in order to get people to vote ‘Yes’. It is supposed to allow people to be convinced to vote ‘Yes’ by using a simple hashtag: #voteyes. However, it isn’t all roses and daisies. There seems to be a fair use of animosity on Twitter – and not just Twitter. Facebook, blogs and YouTube seem to be hostile, filled with arguments about why independence is better for Scotland. On Twitter, especially, you can clock the people who are voting ‘Yes’. They have ‘Yes’ in their profile picture; they have ‘Yes’ in their bio; and they have ‘Yes’ in their cover photo. One, in particular, and this is no word of a lie, had a guy who designed melted cheese on toast in the shape of ‘Yes’. There’s being passionate about your opinions, and then there is making cheese on toast as a statement. Hang your head. The argument continues on Twitter when Scotland Tonight is on air. Very often they have a televised debate which usually ends up in a fat politician being lynched. That genuinely happened in November of last year when Nicola Pigeon (Sturgeon) faced the Secretary-of-State for Scotland, Alistair Carmichael in a match of politician deathmatch. Here, we witnessed the vulgar tongue of Sturgeon who essentially vilified Carmichael on air while he was – and I’m going to quote Malcolm Tucker here – like a sweaty octopus trying to unhook a bra. The man was all over the place, but mainly because the vicious Sturgeon had dropped him into that – a woman who has absolutely no dignity or respect. I took to Twitter following that debate and the Scotland Tonight hashtag was filled with ‘Yes’ voters claiming that Sturgeon had ‘won’. Nobody won. You will only win in September, and that’s if you win. Now it seems that you cannot get away from Scottish independence. Wherever you go, there are people in the street handing out fliers; there is adverts everywhere; there are people wearing ‘Yes’ badges; and there are even households getting ‘Yes’ newspapers through the door! That newspaper is essentially free bogroll, but I don’t want independence shoved in my face. I mean, you don’t provide the Scottish public with a newspaper through their door and state that The Proclaimers are for independence. Nobody cares if those two halfwits are for independence, it isn’t going to swing my vote. In addition to this, there is even sly bribery involved where you can win an iPad and money if you enter a competition. How desperate does one party become in order to gain more voters on their side? I know it isn’t directly targeted towards me but glancing over the next computer, there was someone on the Yes Scotland website which stated that a River City ‘star’ was for independence with a picture that tries to grab the attention of male readers. Great tactic. Totally irrelevant, Sean Lafferty (or Laugherty, perhaps?). That’s why I have become bored of independence. I’m bored talking about it, I’m bored hearing about it, and I’m bored seeing it everywhere I go. Not only am I fed up of all that, I’m sick (yet quietly laughing) at the desperation of the ‘Yes’ campaign. I know it’s extremely difficult to move away from independence, unless you moved to Singapore or something, but you can’t go anywhere without knowing about it. Reading this, you may be thinking, “this guy is definitely a ‘No’ voter.” Actually, I’m on the fence more than anything, but if from now to September there is a continuation of desperation in terms of ideas and off-the-hook policies, I won’t be venturing into ‘Yes’ territory. As an American coming to Scotland for the first time, speak of Scotland’s possible independence is a completely new idea. Hearing about it all the time is strange and it is difficult to have an opinion when I’ve only been here but two weeks. With that being said, I can see where both sides are coming from. On the side of those opposed, it is said that Scotland would be such a small country with its six million people that it would end up being quite a vulnerable country, especially if it came into a war. Also, the saying, “Don’t fix what isn’t broken” in my opinion seems to be quite relevant. I don’t know all that much about the subject, but Scotland seems to be working quite well with the rest of the United Kingdom and so why would it need to become independent in order to have the power, money, etc. to be a successful country? On the other hand, those in favour of independence also have valid reasoning. Certain points that I have heard about are money that Scotland gives to pay for UK-wide services would be saved and able to help the people living in Scotland and the Scottish government would be able to fully focus on improving life for people in Scotland. This does make a good point that Scotland has built up its country and government to be able to support being independent, so why not make it official? Since learning more about the debate of Scottish independence, it seems that a lot of people have become tired of all the talk and many people are indifferent to the situation. In all honesty, I think that is how I would be as well. Politics have always been hard for me to grasp and become interested in. Being here now and knowing a little more about the debate, I’m still indifferent. I can understand why people have differing opinions and would probably be one of those people that did not mind which side won. After discussions in class today about Scottish Independence it struck me how few of us actually have strong feelings about the possible breaking up of the Union. When the topic Scottish Independence there was a mad rush of the search engines as Google took the hit of our ill informed mentality of Scottish politics. The few who were well informed of the subject without the aid of the internet merely voiced their opinion and then accepted the opposing argument. This fleeting attitude towards our futures cannot be a good sign. With the Referendum taking place in September 2014, we have limited time to boost interest among young people. However, in a poll of more than 1,000 over 16s commissioned by the ICM that was released yesterday it found that support for Independence has grown from 32% to 37% since September. This increase has demonstrated that there is a strong chance that Scotland may be divided from the rest of the UK and that we should get concerned, and quickly. Becoming an Independent country could benefit Scotland; we would be able to pass acts that would suit our country and not simply have to make do with what Westminster decide for us. Many laws enforced in England and Scotland are made without much consideration of those up North. Our climate is colder, and therefore, we must take into account issues such as the winter allowances for pensioners. Also, with a lower life expectancy than England, should Scots have to retire at the same age as the English and not enjoy their twilight years for as long? Lastly, Scotland is heading down a different political path than the rest of the UK. Represented by the Conservatives, a party Scotland has rejected for years, why should our country be pulled by the hand like an insolent child by Westminster. Is it time to stand on our own two feet?